Happy 11:11! 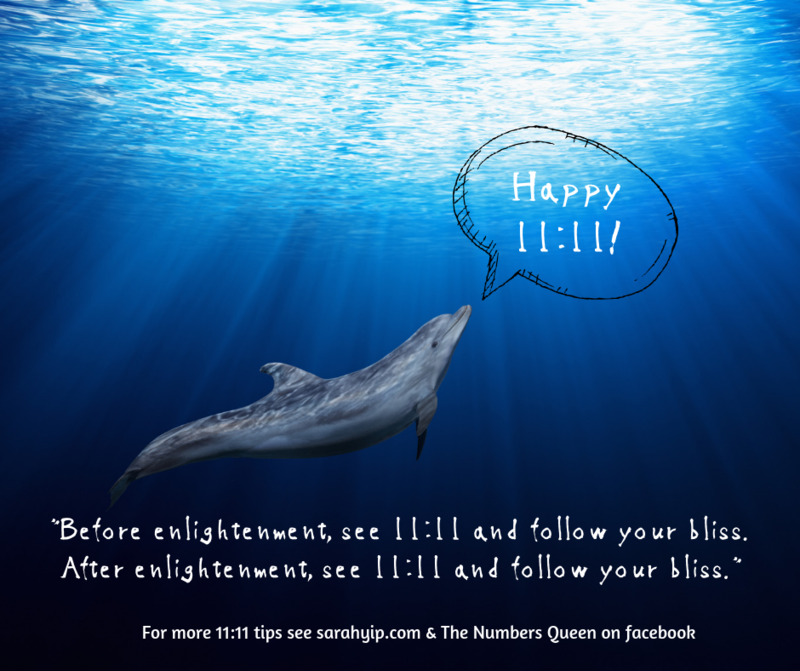 “Before enlightenment, see 11:11 and follow your bliss. 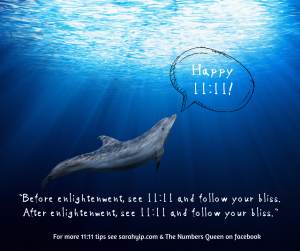 After enlightenment, see 11:11 and follow your bliss.” A message from our dolphin friends, also known as the Sirian Starseeds, who are higher vibrational beings who come to Earth to help us be kinder to ourselves, the animals and the planet. On this magnificent day of total opportunity for spiritual healing, I urge you to let go of anger, fear, doubt and insecurity and walk out your door today ready to change the world. 11:11 is a signal for new beginnings at every level and you can turn your life around starting any time you want. 11:11 means that your Spirit Guides, Soul, ancestors and past life selves are ready and waiting to help you GO UP. You just need to get in the elevator! Next time you see 11:11 (even if it’s this picture), take a moment to close your eyes, breathe quietly into your body and ask ‘what is the next step?’ The answers will come – through images, voices, synchronicities – be ready to document and follow them through and life will never be the same. I know, because my whole life is a series of doorways and magical revelations – hence this Facebook page. It’s not always easy, but it is always extraordinary. 2018 is a Master 11/2 Year of Wake Ups and Break Ups: we’re now gearing up for 2019, a Universal 3 Year of Reclaiming Our Power! Keep an eye on this page for more updates soon.